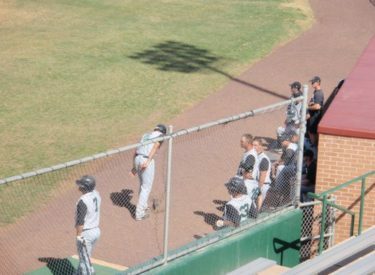 After being swept two of their past four double headers at Garden City, the first place Seward County Saints turned the tables Friday afternoon and evening with a sweep of their own. The Saints won 11-8 and 8-6 at Williams Stadium. In game one, Logan Hall (5-2) went the distance for the win. Seward trailed 4-1 until scoring five in the third. After solo homers by Tanner Rainey (2) and Jake Barrios (5) made it 4-3, Jon Mestas (2) lined a three run homer over the left field wall to make it 6-4. Brittain Ibbotson added a 2-4 day with a triple, a double, and an RBI. Jordan Dallalio drove home two runs with two singles. JT Bean was 2-4 with two RBI’s. Barrios was 2-4 with two RBI’s. Mestas was 2-4 with three RBI’s. In game two, broke a 4-4 tie with three in the eighth. Gavin Glanz went six innings allowing four runs in a no decision before Bryce Ruff (2-0) pitched three innings for the win. Willie Gustin was 3-5 with an RBI. Barrios was 2-4 with two RBI’s. Tyler Hill was 2-5 with an RBI. Ben Wainwright hit his fifth homer of the season. Steve Polito was 2-4 with an RBI while Mestas and Bean also had two hits. Seward is 27-16 overall and 16-6 in the Jayhawk West as the Broncbusters fall to 25-12 overall and 11-7 in the Jayhawk West.